BRISBANE, AUSTRALIA: Elise Kellond-Knight during the women's international match between the Australian Matildas and Brazil at Pepper Stadium on September 16, 2017 in Sydney, Australia. With the FIFA Women’s World Cup only a few months away, we decided to take a look at each position on the field in depth and discuss the various player options available for the Matildas. While there are some certainties, other spots on the field are up for grabs for anybody who can make their mark before June. Elise Kellond-Knight playing for Australia. Credit: Getty Images. Under Milicic, our defensive midfield stock looks deep. At the Cup of Nations, Milicic brought in three out-and-out defensive midfielders in Elise Kellond-Knight, Teresa Polias and Aivi Luik. This trio bring a boat load of experience, composure on the ball and a thirst to win it. Kellond-Knight has been the most consistent in the Matildas starting line up out of the three, and would have to be the favourite to start when the best XI is on the pitch. Luik has been in and around camp, without too much game time, while Polias was an outside chance of a Matildas spot on the other side of the W-League Grand Final. Still, both Luik and Polias saw a bit of time at the Cup of Nations and fit in seamlessly. There’s probably little need to go into too many outsiders here, as three experienced defensive midfielders in and around the squad is a good number to have at this stage. But for argument’s sake, you’ve got Ella Mastrantonio who put in an absolute spell at Melbourne Victory towards the back end of the 2018/19 W-League season at defensive midfield. Whilst inexperienced at international level and hasn’t had the consistency of a full season, there is no doubt her recent form must raise at least one eyebrow, if not two. If you’re looking for youth to take that third spot, there is perhaps either Rachel Lowe or Grace Maher. Both have had rollercoaster seasons, but have the tekkers and hunger to play. If given some experience in the Matildas, there’s potential they could flourish. Despite Polias being in the Cup of Nations squad, she too could be considered an outsider to maintain her spot in the squad. 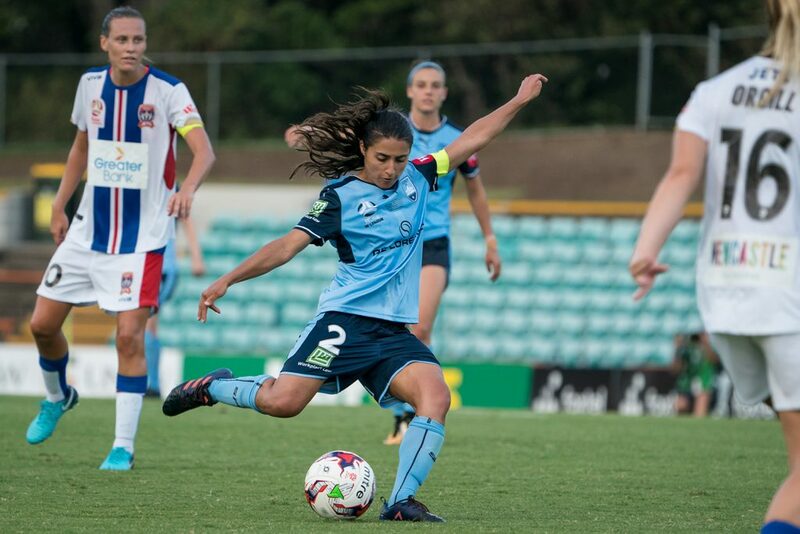 While she didn’t start a game in the tournament and has had a long spell out of the national team set-up, her performance for Sydney FC this season was some of her career’s best. She’d do well to keep her recent spot. Molly is a Contributing Editor for Beyond 90 who endeavours to provide quality analysis of the game and telling a compelling story. Getting her start through her own blog at Molly’s Footy Rants, Molly has since become a match reporter for Football Federation Tasmania and has covered the 2018/19 W-League season with The Women’s Game. She also works at Channel 7 Tasmania in television news.